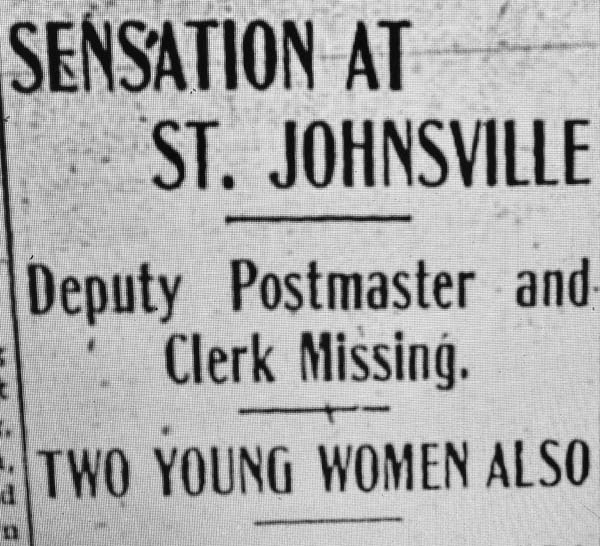 On Monday, Jan. 14, 1907, startling news made headlines from one end of the Mohawk Valley to the other when newspapers revealed that St. Johnsville Deputy Postmaster Alexander Turnbull and postal clerk Harry F. Stichel had suddenly disappeared from their jobs and families, and more shocking yet, both left St. Johnsville with two attractive young ladies. That night’s Amsterdam Evening Recorder gave the known details. Most listeners, however, didn’t believe it. “He’ll be at his desk Monday as usual,” they probably told each other. But when Monday arrived, neither he nor Alexander Turnbull could be found. Later Sunday afternoon, the two soon to be ex-post office employees boarded a westbound train, conscientiously leaving everything neat and tidy behind them at the post office. 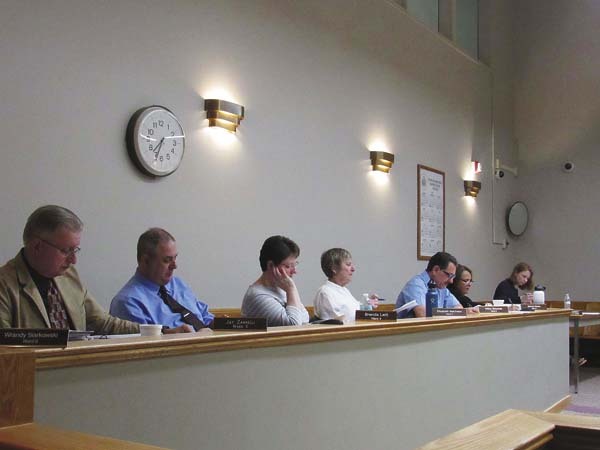 Their accounts were soon audited, but not a penny was missing. Lizzie and May had already left St. Johnsville inconspicuously on an earlier train. It was later discovered they’d told Lizzie’s mother — May roomed at their house — they were going to visit May’s married sister in Utica. On Monday morning when Lizzie’s students gathered at their one room school house, they’d discover the stove cold and no teacher there to greet them, while over at the Lyon factory office, May’s Remington typewriter would remain silent. From Utica west, where had they all gone? “As to their destination, nothing is known. Both families are so completely prostrated over the turn of events they haven’t yet given thought to turning loose the hounds of the law after their errant ones.” It soon came to be known that the travelers were very well financed. Both Turnbull and Stichel were family men, nor were either rumored to be on bad terms with their wives. “Why did they do it?” must have been the primary question asked by many villagers. Perhaps it was less a matter of being ‘disgruntled’ with postal employment or home life than the fact that in those old times, finding two young ladies willing to cast away their own positions and reputations to traipse off on a lark with two older, married men wasn’t easy, and the fact that both were reputed to be particularly attractive must have sealed the deal. Then one day months later, half of the disappearing quartet returned. Lizzie McGee shortly returned without him. The Feb.16 Leader-Herald reported Harry F. Stichel’s death at age 88 on Valentine’s Day, 1958. 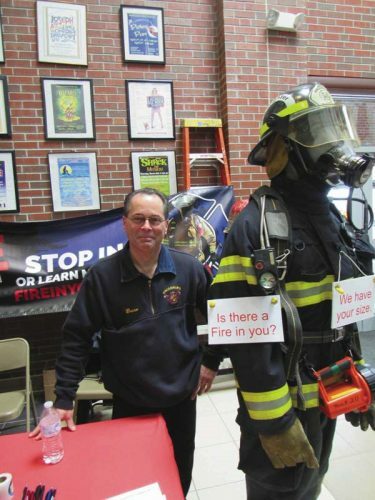 Over the ensuing decades, he’d apparently redeemed himself in the eyes of both St. Johnsville and Montgomery County, somehow transitioning from postal clerk to St. Johnsville Fire Chief, becoming president of the NY State Fireman’s Association and also serving as Montgomery County Republican Chairman. It seems he’d become as good at putting fires out as he’d once been at starting one. For Alexander Turnbull, there was no returning. The Nov. 23, 1946 Morning Herald reported his death in Detroit. Like the elephant in Groucho Marx’s pajamas, how Turnbull got to Detroit we’ll never know.